Site in Nakuru where Itare dam is to be constructed by CMC di ravenna. The project has stalled (file photo). Italian contractor CMC di Ravenna has not surrendered any of the 98 vehicles and construction machinery for safe custody to a Nakuru yard as ordered by the High Court in Nairobi. This is after the court directed seizure of the machinery and vehicles awaiting the outcome of case filed by Barclays Bank. High Court Judge Francis Tuiyott had stopped CMC di Ravenna from selling, transferring or interfering with equipment and 98 motor vehicles that were bought through loans advanced by the Barclays Bank of Kenya. The bank is pursuing a Sh585 million debt and moved to seize the property fearing that the Italian firm may tamper with it and thwart the lender's efforts to recover the money. The Nation visited the land owned by Casuarina Limited in Nakuru Wednesday where the court had directed that the vehicles and machinery be taken for safe custody. But by Wednesday evening there was no indication that the directive had been honoured. In an agreement attached as evidence in court, Barclays Bank was allowed to seize the motor vehicles and assets. A source privy to the goings on revealed to the Nation that the company was yet to honour the agreement entered by both parties in court. "Since Monday l have not seen any vehicle or machinery being brought into this place," said the source who sought anonymity. The seized vehicles were intended for use in the scandal-hit Arror, Kimwarer and Itare dams, which have become the focus of criminal investigations by detectives. The Nation learnt that in Kuresoi, Nakuru County where the company has been constructing the now stalled multi-billion Itare dam, heavy security had been deployed to ensure the firm does not sell, transfer or interfere with equipment. 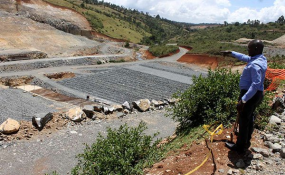 The latest developments have added into the financial problems that saw the Italian firm abandon construction of the Sh38 Itare dam in Kuresoi and also failed to start building Arror and Kimwarer dams in Elgeyo-Marakwet County. Hopes that the construction of Itare dam would resume soon have further been dwindled, with its fate unknown even as Nakuru leaders protested over the stalemate. Led by Governor Lee Kinyanjui, the leaders have written to the national government seeking an urgent resolution of the stalemate that has led to the stalling of the dam's construction. The leaders waded into the impasse saying that stalling of the dam will greatly affect the progress of Nakuru town which is in the process of becoming a city. "Hopes of water supply for Nakuru town, Molo, Njoro town, Elburgon, Rongai and parts of Kuresoi were pegged on the completion of the dam. The stalling of the project is, therefore, a matter of grave concern to the residents as it means they will continue to experience water shortages. We also want the government to deal firmly with those who will be found culprits in the graft allegations in the project," Governor Kinyanjui told the Nation. Other leaders who called for quick action on the the dam issue were MPs Samuel Arama (Nakuru Town West), Joseph Tonui (Kuresoi South), and National Assembly Deputy Speaker Moses Cheboi who is also the Kuresoi North MP. The dam is one of Jubilee administration's flagship projects for water supply under Vision 2030. It was set to be completed in 2021 but it has now stalled. It was billed as the largest of its kind to be undertaken in the South Rift region after the Sh5.5 billion Chemususu dam in Baringo County. The Directorate of Criminal Investigations is investigating the multi-billion dam scandals that have rocked the country. While billions of shillings have been released for construction of the dams, there is little on the ground to show how the money has been spent.